As you can see I added quite a bit of colour. I chose to focus on the snowflake that was cut out and then set back in, but offset (I think that is just so clever!). 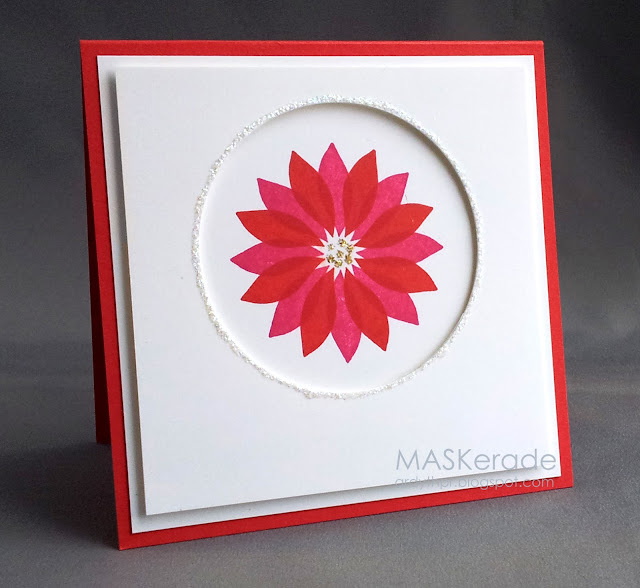 I created a 'window', stamped my Impress flower in Poppy Parade and then offset it and stamped it again in Melon Mambo. I carefully added gold Stickles in the centre of the flower and Stardust around the frame. There's still time for you to play along - the deadline is Monday morning at 8:00 am. If you're out of time and can't make a card, you can still vote for your favourites between Monday morning at 8 and Tuesday morning at 8. Gorgeous colors! Poppy Parade and Melon Mambo....only you would think of a fabulous color combo like this! Love the wee bits of gold in the centre! And of course the stickle border is PERFECT! So gorgeous Ardyth, simply beautiful! gorgeous card Ardyth! love the colour and sparkle! Very pretty card, I love the added sparkle. Gorgeous color combo, Ardyth! I also love your clean and graphic design...I love all the sparkle, too! Love your take on the Muse card!